The superior blade stock we use for our saw blades is ideal for Hand Scrapers. It is a thin, hard high carbon Swedish Tool Steel. Our Hand Scrapers are 2-1/2" x 6". The set includes two scraper blades — one is .020" thick making a very supple scraper, and the other is .032" thick, making it much stiffer. These blades are ground square on the long edges, are easy to use and very handy. Click here to view our YouTube video on Making a Chair Scraper with Aled Lewis. Your scrapers can finish surfaces that are impossible to plane. However, if you work too long in one area, it is hard to control the flatness of the entire surface. A scraping plane is useful to use in combination with hand scrapers. Work difficult areas with the hand scrapers as needed; keep the surface flat with the scraping plane. The thinner blade (.020") is quite flexible, and is great for scraping shorter, complex surfaces. The thicker blade (.032") will take a heavier cut, and is best for larger surfaces. Burnishing: Before you use the scraper, it is helpful, but not absolutely necessary, to turn a burr on the edges. Use of a burr will give more aggressive cutting action. To create a burr, hold the scraper upright in a vise. Use a burnisher and begin by holding the burnisher at 90° to the blade, decreasing the angle with successive passes. Work the edge until you can feel a distinct ‘hook’ all the way across. Be very careful not to cut yourself on the upright scraper. When re-sharpening, first hone the old burr off, then square the edge with a stone or file, and repeat the burnishing process. You can usually re-burnish a few times before it becomes necessary to square the edge. 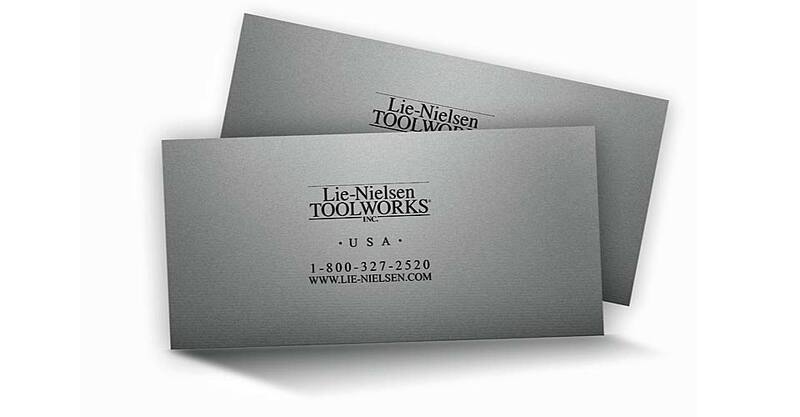 Materials: The Lie-Nielsen Hand Scrapers are made from premium, high carbon Swedish Tool Steel hardened and tempered to Rockwell 49-51. They will take a burr well and last a long time. The long sides have been ground square. If you wish to use the short sides, file square before burnishing. Maintenance: The scrapers are made of Steel and will rust. Keep them lightly oiled and wrapped in cloth or treated paper when storing the scrapers between uses. We recommend Camellia or Jojoba Oil - vegetable oil based products. They are non-toxic, odor-free and easy to use. Also, in our shop, we use a fine abrasive handblock to remove any light surface oxide from tool bodies and blades. The oils and the abrasive handblock are available from us.